Not only the opening line of a great song but also the perfect place to experience the stark beauty of the high Chihuahuan Desert. 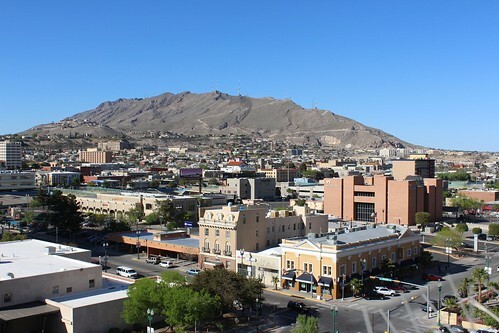 The city sits nestled between the Rio Grande River and the Franklin Mountains, and any one of the many hotels in El Paso will make an excellent base camp for explorations. With peaks reaching over 7,000 feet high, Franklin Mountains State Park is the place to begin. The entire park is completely contained within the city limits, making this perhaps the most spectacular urban park anywhere. The views of the city are spectacular along several scenic drives and trails. Or for an even better perspective, the Wyler Aerial Tramway climbs to the summit of Ranger Peak. Three states and two countries are visible from this more-than-a-mile-high perch. But if, like Veronica, the thought of dangling in a gondola riding high above the crests and valleys is too much to take, there is an option to walk up the Ridge Trail. Best yet, after spending the day hiking, mountain biking, or picnicking in this alpine oasis rising up from the desert we can still end the day with a hot shower, a good meal, and a cozy bed. After a look at the big picture, we’re ready for our close-up. The Chihuahuan Desert Gardens is perfect for an in-depth investigation of the vast variety of tenacious vegetation that flourishes in this climate. The collection contains over 600 species of plants indigenous to the region. As part of the University of Texas at El Paso, the groups of themed assortments are a valuable tool for botanical and environmental education, or simply enjoying for their beauty. Just down the road, the Chamizal National Memorial is not what we’d call a garden in the classic sense, but the landscaped grounds are perfect for a picnic or for attending a concert in the amphitheater. The memorial also includes art galleries and a museum that explains some of the history of the U.S.–Mexico border and disputes that have arisen when the river has changed its course. Speaking of history, much like the San Antonio Missions National Historical Park that we visited several years ago, the El Paso Mission Trail connects Spanish missions dating back to the 1600s. Beginning at the Ysleta Mission, celebrated as “the oldest continuously active parish in the State of Texas,” the trail travels through some of Spain’s earliest established outposts in what would later become the United States. These served as more than churches, they functioned as political footholds in the expanding New World. Traveling southeast along the Mexican border, the next stop on the trail is the Socorro Mission. Completed in 1691, this comes in as a close runner-up, being the second oldest settlement in the state. 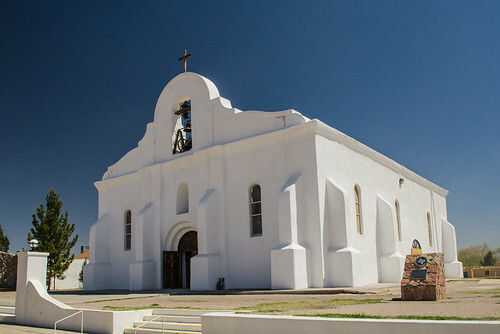 A few miles further, and about one hundred years later, the Spanish Crown established the San Elizario Presidio as a military compound to provide protection for the missions. It served as an important stronghold for New Spain, but soon Mexico won its freedom from the colonial power. Before long Texas declared its independence, followed by the war between the U.S. and Mexico. After that the fort was abandoned and now all that survives is the chapel. The confluence of these cultures reminds us that our explorations could not be considered complete without a taste of the cross-border cuisine that Texas is famous for. We wouldn’t think of leaving before tasting the best Tex-Mex food to be found. That’s what we’d call saving room for desert. This article was created in collaboration with InterContinental Hotels Group.